While you are pregnant, your skin and abdominal muscles slowly stretch over the course of nine months to accommodate your growing belly. Once you deliver your baby, there are things you can do to help take care of your belly while it recovers. It is normal to experience a rounded or saggy belly after delivery and it will be especially pronounced for the first couple weeks. During pregnancy, your body goes through extensive and amazing changes and your belly is clearly affected the most. Your age, genetics, fitness level and weight gain during pregnancy will also factor into your belly recovery and if you delivered by C-section, you may experience additional swelling of the abdomen from the incision. The uterus, abdominal muscles and skin have grown and stretched over nine months so it will take some time for the overall area to decrease in size. It will take about six weeks for the uterus to go back to pre-pregnancy size, however, your skin and muscles may take up to months to shrink down after giving birth. After you deliver, your belly will begin to decrease in size due to hormonal changes in your body. Fluids from the swelling during pregnancy will also begin releasing through urine and sweat. If you are breastfeeding and plan on exercising, the extra fat that accrued during pregnancy will begin to burn off as well. The linea nigra is a dark line down your belly that you may have after delivery. This is caused by pigmentation in the skin where your muscles have stretched and separated somewhat with your growing baby. Within a few months of delivery, this dark line usually fades. 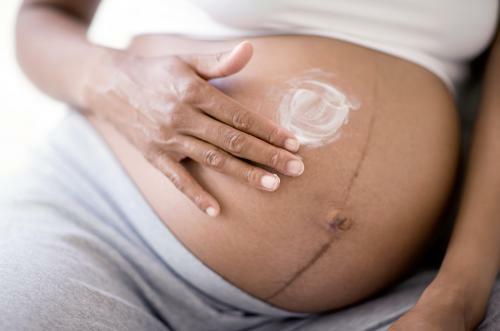 You may develop stretch marks on your belly during pregnancy. Stretch marks can happen when your skin stretches and shrinks too quickly. It is a type of scar that forms when the collagen and elastin in the skin rupture and stretch marks may appear as the skin heals. Fluctuating hormones may play a role in the development of stretch marks as well. Regardless, how fit you may be, it is normal to experience loose skin after delivery. Sometimes after delivery, your skin may have trouble 'bouncing back' and returning to its original shape. You need to be patient as it takes time for your loose skin to heal. Drinking water will help keep you hydrated and keep the skin more elastic. Eating healthy and including more protein in your diet can help you build muscle and improve skin elasticity. Regular exercise can help. When your doctor says it's okay, try cardio exercises such as jogging, biking, swimming, and walking. This can help burn fat and tone muscles of the belly. Lose the weight slowly. If you lose weight too quickly, you could lose muscle which keeps your body toned and fit. Abdominal and core exercises will help tone your mid-section. Strength training can help build muscle tone and have a positive effect on loose skin. Certain creams, lotions and plant-based oils may help repair and tighten the skin. You may want to consider the lotions that contain collagen, vitamin C, A, E, or K and retinoids. Use an exfoliating scrub on your skin. This can help increase blood circulation and generate a healthier, elastic skin. Spa wraps may be used for special occasions only. It can temporarily help with skin firming, detoxifying and softening. Diastastis recti is a weakening, stretching and eventual separation of muscles of the abdominal wall that occur after childbirth. This can cause pain, inflammation and some bruising. Exercise is typically the preferred treatment. Lower abdominal pain after delivery is normal, and it is not unusual for that pain to be rather intense over the first few days. This sharp, cramping pain is called afterpains. This is caused by the uterus contracting back to normal size. A heating pad may help alleviate the pain. Itching may occur after you deliver your baby. The itchiness is commonly caused by stretch marks which can be treated with creams and lotions. But if you're experiencing the following symptoms, you should contact your doctor immediately. If your pain is severe or consistently worsening. If your sides are extremely tender. If you have nausea and vomiting. If you had a C-section and have redness or pain at the incision area. Be reassured that most women have a postpartum pooch after delivery. You can gradually work on getting your pre-pregnancy body back but it is also important to give yourself time to heal. However, it is even more important to enjoy and spend time with your new baby.